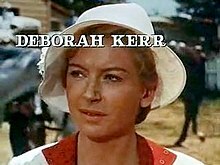 Deborah Kerr as Ida Carmody. 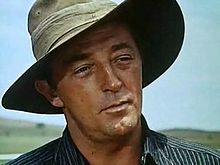 Robert Mitchum as Paddy Carmody. 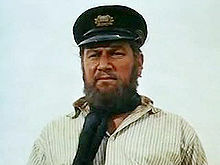 Peter Ustinov as Rupert Venneker. The Sundowners is a 1960 film set in Australia's Outback during the early 20th century in which the impoverished Carmody family lives a nomadic life out of their wagon. The mother and son want to settle while the father is against it. Directed by Fred Zinnemann. Written by Isobel Lennart, based on the 1952 novel by Jon Cleary. This is a good country for sheep and it's not bad for men, but it's hard on us women. The men come here because of the sheep, and we come here because of the men, and most of us finish up looking like the sheep. Wrinkled faces, knotty hair, and not even much of a mind of our own. Nothing is as revolting to the young than to see their elders at play. Paddy Carmody: Do me a favor, will you? If you're gonna be a drover, look like a drover. Get rid of that silly flaming hat. Rupert Venneker: Let me tell you about this silly flaming hat, my good man. Paddy Carmody: And don't call me that. I'm not your good man. Rupert Venneker: Would you prefer boss? Paddy Carmody: Wouldn't be a bad idea. Rupert Venneker: This cap belonged to a ship's master in the China trade. Paddy Carmody: Oh, what happened to him? Rupert Venneker: Nothing happened to him. He's just not going to call you boss, that's all. Sean Carmody: [on hearing Venneker had been a ship's captain] Why'd you leave? Rupert Venneker: My stomach. I was a notoriously bad sailor. Sean Carmody: Dad says you must have been a better sailor than you are a horseman. Rupert Venneker: What the devil is he talking about? I was cashiered from the 17th Lancers before he knew one end of a horse from the other! NOT that he does now! Hah! Sean Carmody: What does cashiered mean? Rupert Venneker: Uh - kind of promotion from the army into civilian life. Sean Carmody: Gee, it's gonna be fun. This is the first time I've ever been away from home. Shearer: What, with your mom and dad not fifty yards outside that window, and you call that being away from home? Rupert Venneker: Certainly. Being out in the world is a state of mind, not of geography. The distance between that tent and this bunker is the longest journey you will ever make in your life. The Sundowners are here! A roaring chip on their shoulder---A rousing challenge on their lips! Across Six Thousand Miles of Excitement...Across a Whole World of Adventure Comes the Rousing, Story of Real People Called "The Sundowners"! The renowned cast. The rugged country. The joyous adventure classic.